A dental bridge is permanent way to replace any missing teeth. Porcelain fixed bridges are most popular because they resemble your natural teeth. 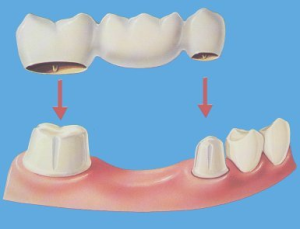 This bridge consists of two crowns that go over two anchoring teeth and are attached to artificial teeth, filling the gap created by one or more missing teeth Dental bridges are highly durable because they are made of a combination of metal and porcelain. Occasionally, they will need to be re-cemented due to normal wear.